WED2B is one of the largest and most affordable bridal retailers in the UK and specialises in making sure every bride-to-be looks and feels amazing on their special day. As a nationwide business, WED2B are passionate about their business and core principals of quality, choice and service. The interior design of each of their stores is carefully planned and executed to the highest standards, so the choice of flooring is no exception. Tarkett was the natural choice for their luxury vinyl floor tiles. 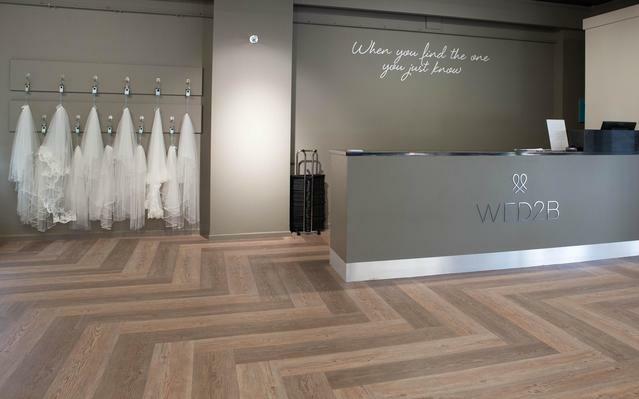 To further enhance the customer experience in the new WED2B store in Ashford, Kent a combination of top spec iD Inspiration 70 Luxury Vinyl Tiles featuring brushed pine grey and brown tones was selected. As well as looking fabulous, the tiles are manufactured to stay looking great – even in the face of high foot traffic. Treated with our unique Top Clean surface protection system all the planks and tiles in this collection have the additional benefits of both easy maintenance and a high resistance to scuffs, scratches and stains. The combination of a gorgeously realistic wood effect pattern, with the high performance benefits, made Tarkett’s iD Inspiration 70 the perfect match for WED2B’s needs. One could very well say that brides-to-be visiting the Ashford store will be walking on luxury while they decide which fabulous gown they will wear when they walk down the aisle on their special day. With high foot traffic in our stores, we needed a flooring solution that not only looked great but would be extremely durable.